Description: Hey, Kiddo is the graphic memoir of author-illustrator Jarrett J. Krosoczka. Raised by his colorful grandparents, who adopted him because his mother was an incarcerated heroin addict, Krosoczka didn't know his father's name until he saw his birth certificate when registering for a school ski trip. Hey, Kiddo traces Krosoczka's search for his father, his difficult interactions with his mother, his day-to-day life with his grandparents, and his path to becoming an artist. Review: I was first introduced to Krosoczka's work while I attended my first library conference in Chicago a few years ago. I read and reviewed his hilarious Lunch Lady series which is an elementary/middle grade graphic novel series in which the Lunch Lady of the school is an undercover vigilante who saves the day. 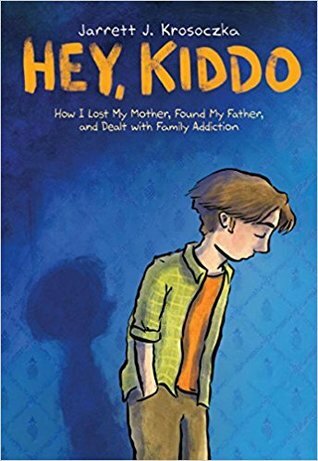 So when I read the press release for Hey, Kiddo his latest graphic memoir I was taken aback on the subject and maturity of the style and themes, which is not necessarily a bad thing. In a deeply sensitive, candid, vulnerable memoir Krosoczka recalls the triumphs and tragedies he experienced from infancy through his high-school years. He was figuratively left in the dark regarding the identity of his father and his mother's strange behavior and absences. When he was less than five years old, his grandparents took official custody and it was not much later did he learn about his mother’s addiction to heroin, her habitual incarceration, and the swinging door of rehab facilities. Other serious hardships such as verbal abuse, violent crime, and family alcoholism also have a strong impression on Krosoczka’s childhood and adolescence. Though there are heavy themes in the graphic memoir, there are also some lighter moments too such as Krosoczka and his friends try to do their own version of Wayne's World and the author's sense of humor in his art which he initially used to impress his friends but later became his way to survive. I really like the addition of Krosoczka’s actual childhood artwork (from early crayon drawings to high-school gag comics) and handwritten letters to and from his mother and others which are seamlessly inserted into the gracefully rendered ink illustrations. This gives the graphic memoir an intimate feel and sets it apart from other graphic memoirs that I have read before. It was also interesting to note that the brush stroke changed just like the emotions the panels try to capture. The graphic memoir also has a limited palette of gray and orange washes that makes it easy for the reader to know that the story is a memory. What I most appreciated about Hey, Kiddo is that Krosoczka has meticulously crafted an uncompromisingly honest portrayal of addiction, resilient familial love, and the power of art, which was no doubt incredibly hard to do. Words of Caution: There is strong language, underage drinking, and allusions to drug abuse. Recommended for Grades 9 and up. This is my choice for Printz and for YALSA Nonfiction Awards this year for all the reasons you mentioned. I am so glad you loved this one; I think it is so good. I loved the author's note at the end where he explains everything.